On this week’s Ask Chelsea Anything, we’re talking with a reader who has found herself in one of the most unfortunate-yet-frequent realities of post-grad professional life: she landed a job in her field, and found out that it wasn’t at all what she wanted, or what she thought it would be. Now the question is: how long do I ‘make it work’ with a job I know I’m going to leave, in order to give myself a safety net to follow the dreams I actually want to make a reality? 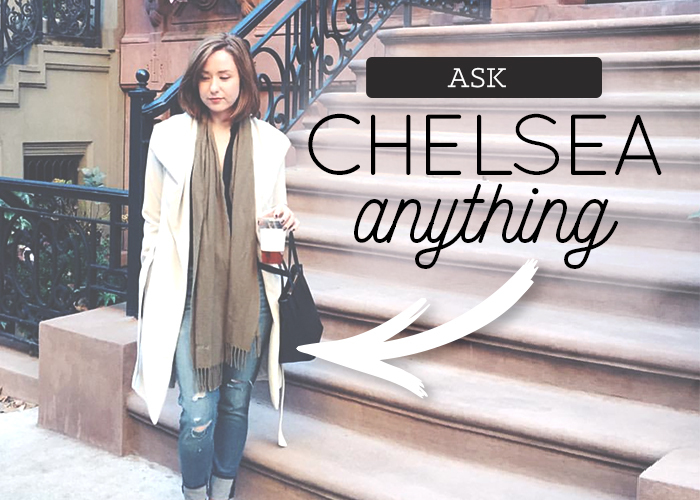 As always, don’t forget to send your burning questions to askchelseaanything@thefinancialdiet.com, and without further ado, onto this week’s question! To make a long story short, I’ve been working at a digital marketing agency for about six months. It is my first ~real job~ after completing undergrad. The agency markets itself as cutting edge to its clients and a fun, supportive work place to its prospective employees. The agency doubled in size in 2015, and is projected to double again in 2016. We have been told by upper management that this year the agency would get ahead of the hiring rut, but so far we’ve only become increasingly understaffed while taking on an unprecedented amount of client work. Our manager has taken this very personally, and called us unprofessional, inexperienced, and suggested that we are unsuited for agency life. We have a lot of suggestions for improving our processes and practices. Our recommendations have been dismissed and discredited since she took on the management role at the beginning of the year with no previous experience on our team. At the behest of our manager, we are using out-of-date, ineffective practices. Client cancellations are increasing. We can see the glacier on the horizon and most of us are heading for the lifeboats. For the time being, I can hang in at my current job and save about $1,000 per month. My plan had originally been to complete a year to a year and a half at my current position before moving to Los Angeles to pursue my ~dream career~ in television production and screenwriting. I have friends in LA in production assistant positions who are willing to help me find something and get settled. My question is this: would it be more beneficial to move to Los Angeles sooner, without a job lined up and with minimal savings, in order to focus on transitioning my career, or should I stay in my current position until I receive an offer or build up my savings a little more? Because I am primarily looking at entry-level positions, I don’t know that I will receive a viable offer while living out of state. I could easily see myself spending another year at my current job producing work I am not proud of while waiting for an offer that’s never going to come. Sorry this is so long-winded! There is a lot going on in my current position that is contributing to my unhappiness. The idea of throwing myself into pursuing my dream is the only light at the end of a long, dark tunnel at the moment. I want to be smart and strategic, but my current job is occupying most of my waking hours, and making it difficult to explore my other options. Hey Stressed. So, I think there are really two things you have to come to terms with in this question, and one is definitely the bigger and more ~philosophical~ of the two, so let’s start there: jobs are hard. And jobs in glamorous, competitive industries, like entertainment, media, and advertising, tend to be even harder. The things you’re describing are extreme, yes, but they are very standard (if in nature, not necessary in volume) from most people who work in advertising or marketing to some capacity. As someone who has worked, directly or indirectly, in this field for her entire (little) career, I can confirm that the overwhelming nature of client work and the desire to constantly be taking on more is very common. However, the way you describe things, you are right to be considering moving. While some feeling of being overworked is pretty much unavoidable in your industry, attempting to set realistic boundaries with a manager (if nothing else than to prevent client dropoff), and being totally dismissed/insulted, is not acceptable. That being said, the general point of “jobs are hard” is going to be inescapable, and is likely to be even more of an issue as you transition to an even more competitive and glamorous industry. Lauren even wrote a piece earlier today that mentions some of the dismal statistics given out by a Guild as far as how many actors are even working in a given year. Yes, you aren’t getting into acting, but the fact remains: you are looking at going from one stress-filled, hyper-competitive boat into one that is even more so. And as someone who has many friends who work in the film/TV industry in many capacities, I can tell you that they nearly all have some kind of horror story, and are working in an actively-shrinking environment. The ones who make a lot of money are constantly on the verge of losing that job, and the ones who are trying to break into or upwards are basically earning most of their money from their side hustle while waiting for something to give. This is not to say that it’s not a worthy dream to pursue, but it does mean that you should be as lucid as possible about the environment you’re actually looking to get into, and if you’re someone who is incredibly stressed about the kind of work environment you described, you should especially consider what this transition might mean in terms of workload, with the drastic reduction in financial comfort you’ve described. Which brings me to my second point: any job you have just out of college that lets you save $1,000 per month should be held onto for dear life until you meet certain savings goals. What you have is a unicorn, financially, and you need to take full advantage of that while you can. Especially if your plan is to jump into something much less stable, it is your responsibility to yourself that you make sure that basic things: emergency funds, some basic investments, etc are taken care of while you have the opportunity to do so. At the bare minimum, you should be socking away enough to get by for six months with no income, particularly since you’re looking down the barrel of a professional choice that might make that an immediate reality. If I were you, I would figure out what your savings goals are and work backwards from there. You can still put some work into setting up your eventual transition to LA, but you need to be as aware as you can that this is your financial time of plenty, and you need to prioritize planning for times of lean way more than you need to be looking for gaffer jobs on Craigslist. Your LA dream can wait a year, your savings may not be able to. And more importantly, the idea that a job like the one you want to get into will not present likely many (if not all) of the same professional issues that are making you want to quit now is just foolish. Dreams are wonderful to keep us motivated, but we can’t let them become too built up in our minds, because we’re only setting ourselves up to be disappointed (and/or financially devastated) if we do. In college, you thought your current job was going to be a dream. Who knows what you’ll think of your Hollywood gig a year or two into working it. Above all, keep your eyes open, and your dreams realistic.